* ( NOW KNOWN AS THE DEKA INTIMIDATOR) Fine, highly porous microfiber glass separators absorb the electrolyte, increasing efficiency by lowering internal resistance and boosting capacity. * Lower internal resistance also means that the batteries can be recharged faster than conventional batteries, allowing the user to put them back into operation sooner. * The completely sealed, valve-regulated AGM battery eliminates gas emissions and acid leakage for longer and safer battery operation. 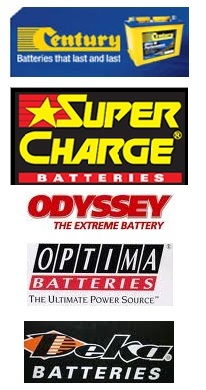 * AGM batteries are also completely maintenance-free. Charging: Use a good, constant potential, voltage-regulated charger.or 12-volt AGM batteries, charge to at least 14.4 volts, but no more than 14.6 volts at 68F (20C). Do not charge in a sealed container. * 187 Amp Hour / 20 Hour Rate.